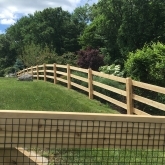 At Roots Landscaping our professionals provide masonry, fencing and other maintenance services which can turn your land into a wonderful work of art. Our host of landscaping services can improve your land, adding both cosmetic appeal and an increase in market value. We not only train our people to be safe and efficient, but we instill in them dedication to doing their best work. As well-skilled and experienced landscapers we are experts in shrubbery, water usage, perennials and trees. We know which tree should be planted where and we can accurately assess the planting location of flower beds and shrubbery so that they will substantially increase the aesthetics of your home. We don’t just plant flowers either! Roots also provides lawn care and lawn maintenance services to homeowners and businesses in New Fairfield, CT. Our services include mowing, weed control, mulching, tree planting and trimming and much more. Whether you need weekly or bi-weekly maintenance, we can customize a schedule that works for you and your home. For spring, summer or fall, we are New Fairfield’s #1 landscaping business to call. Let us help you choose the right mulch for your garden and flowers, so that it not only locks in moisture, sunlight and nutrients in the soil, but also makes your plants look as beautiful as possible. We will advise you on the right mulch to use and then you can let us do all the work for you. Are you looking to plant a new tree or bush somewhere on your lawn? We do that. Do the existing trees and shrubs around your New Fairfield home need maintenance and care? We do that too. We can help you with pruning and care services for trees, shrubs and plants. This not only means a clean looking lawn but healthy plants with lush growth that will add to the beauty of that lawn. If spring snuck up on you or fall left your New Fairfield property looking less than its best, we at Roots Landscaping are here to help. In addition to our other services, we provide fall cleanups that help you get your lawn in top shape for winter and spring cleanups that will get your lawn looking gorgeous for summer. Our cleanups include removing leaves and dead plants, as well as trimming and tidying branches and trees, pruning shrubs, cutting the lawn, and checking all the property. We will also provide storm cleanups around your New Fairfield home. Professional landscaping services don’t just make your lawn look pretty, they add value to your New Fairfield property. Our professionals know you have a vision for your lawn and they will work with you to make it come alive. After our consultation has given us an understanding of what you want, we will start to design the space and then start the transformation. Choose from a wide variety of perennials, annuals, shrubs and trees, as well as walkways and stone walls, and we can install it all. We also provide services to commercials properties. 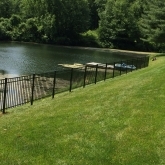 In fact, we have helped restore the landscaping at several respected companies around New Fairfield. In addition to our many other services, we can build water features around your office. Want to add a pond in the courtyard? Give us a call! 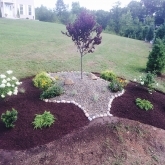 At Roots Landscaping we have the resources, creativity and diligence to get the job done on time, and following the specifics requested by homeowners and commercial owners alike. Your landscaping is the first impression your business shows to your clients and customers. Don’t let unkempt trees and fences be the roadblock to your continued success. 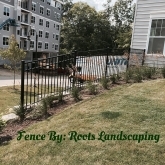 At Roots Landscaping, we know you want the best masonry, fencing and other landscaping to speak for you. Our experts will explain the exact process, and the design of the landscaping, to ensure you know just what you will be getting. Our landscapers are here to answer your questions and use the proper equipment and tools to provide the best quality work. Let Roots Landscaping help your business succeed in New Fairfield, CT. Roots Landscaping is accredited by the BBB and provides high-rated services. Contact Roots today to learn more about how we can help improve your landscape, or if you’d like to learn more about our company, services, and team. You may also call us today at 203-304-7326.